(WIRED) -- Apple's carefully thought-out notebook designs, as well as the clean lines of the iconic Apple Stores, make things very easy for smash-and-grab thieves. 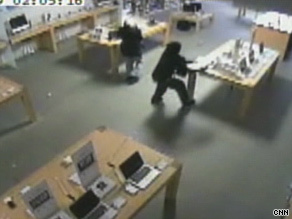 A security camera captures thieves looting an Apple store in Marlton, New Jersey. Better. Faster. Easier. That is the slogan for Apple's new operating system, OS X 10.6 Snow Leopard. It could also refer to the heist that took place Wednesday in Marlton, New Jersey. Next, the thieves signaled to the security guard that they had a gun and then took off along the long, clear tables of merchandise, the straight run allowing them to efficiently scoop MacBooks and iPods into their swag bags. Wired.com: What’s Inside a Slim Jim? The magsafe cords detached instantly, offering no resistance and leaving power sockets undamaged. Finally, the stiff unibody shells meant that the villains could grab the notebooks one-handed from a corner with no flexing, and no risk to the internal circuitry, the tough aluminum bodies resisting the jostling clanks inside the sacks. And so we see that it is true that Apple really does design for the end-user, with small efficiencies that all add up. Thanks to Apple, the scoundrels managed to load up their booty  23 Macbook Pros, 14 iPhones and nine iPod Touches  in just 31 seconds. As Steve Jobs might say, "Boom!" Store employees should watch for anyone wanting to buy 23 main adapters in the next few days.